We haven't improved the game. Just The Drive. It's safe to say you've never driven a golf car like The Drive™. 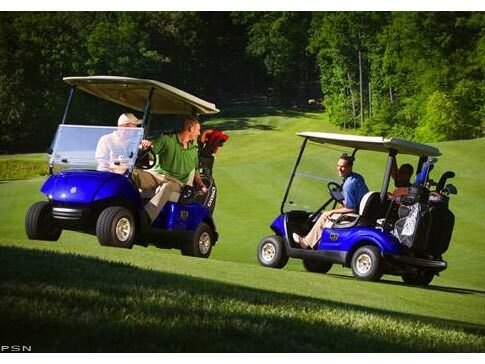 Because there's never been a golf car like The Drive. Everything about it has been re-thought, re-worked, re-conceived, re-engineered for a driving experience you'd never expect on a golf course. 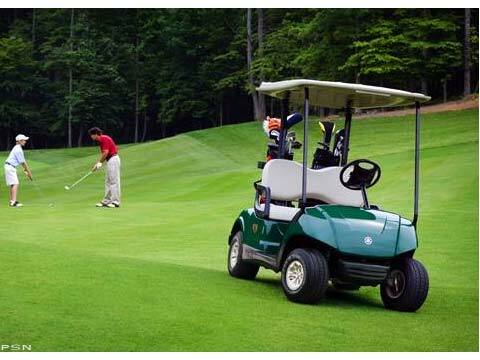 No other golf car can make this claim. Because we use higher-quality parts, like sealed bearings, automotive-grade tie rods and steering components, our chassis is virtually maintenance free. How much time did you spend on grease jobs last year? Wipe that number off the slate. Greasing golf cars is over. In three years of developing it, we figured out how to build our golf car with fewer parts. 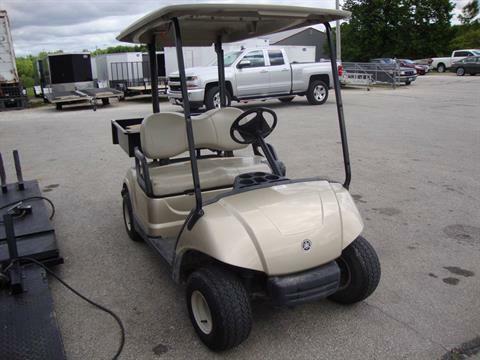 In the bargain, we also got more reliability, easier maintenance, less weight, fewer things to go wrong, all you could hope for in a golf car fleet. Call it "the magic of concurrent engineering". The auto industry spent a hundred years getting this right, so we put their principles to work for you. We gave it four cup holders to hold different-size cups; a center storage area for wallets, cell phones, and personal items; six ball holders; six tee holders; and a big, easy-to-clean storage compartment on each side. You know and we know: things happen out there. So we made our bumpers with thicker walls and textured surfaces to withstand mishaps. They're the same height front and rear because things happen in the golf car barn too. They release air on impact; in fact, they're five miles per hour rated, and if worse comes to worst, you can replace them by removing only two bolts. Best window of entry and exit. Best leg space in the industry. Best foot space, rear body to pedal. Improved steering height and position. Improved seat height and position. Improved headroom. There's no better space to occupy, and we've got the numbers to prove it. The wheel, the seat surface, and the ClimaGuard Top™ are all the same color, because we believe it's the little things that make a design a success. What's more, the wheel is color-compatible with each of the three wheel-cover options and with all body colors. Every element of the driver's space-from the dash to the pedals, from the steering wheel to the armrests, from the seat to the top-was designed to provide optimum comfort and ease of use for drivers of different sizes. You know that really gross stuff that collects in the bottom of cup holders? We don't have that. Our cup holders are built with drain holes that keep liquids and debris from accumulating, and they're removable, so cleaning them is a snap. There’s a reason why we call it "Genius". Using a common PDA and an infra-red wireless connection, the Genius2 allows fleet service technicians to communicate with the motor control unit. In addition, it enables customization of the speed and regenerative braking, using 25 settings to match your course and terrain. It stores and displays battery and vehicle date such as AMP hours, miles and MCU serial numbers, as well as diagnostic and troubleshooting information, helping you to get peak performance and maximum profitability from your fleet. 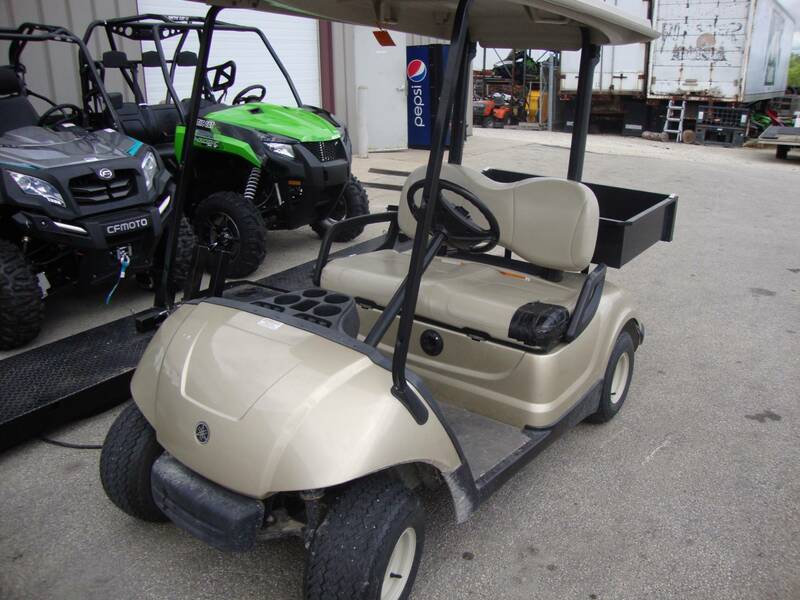 Just because we’re setting you up with the most dependable, least maintenance-intensive golf car fleet in the business doesn’t mean we won’t be there for you. We have a network of factory-authorized service technicians to make sure your fleet service needs are met. And our factory-authorized technicians have state-of-the-art mobile service centers, fully stocked with parts. Our Yamaha gasoline engine uses a splash-style positive oil lubrication system that eliminates the need for an oil pump. And with no oil pump to protect, there’s no need for an oil filter. You save on maintenance, you don’t have to buy new filters, and you don’t have to figure out how to dispose of the old ones. Our panels are made of custom-formulated thermoplastic olefin with superior flexibility, durability, and cold resistance. They lock together and mount with fewer mounting points for better removability; they're robotically painted with a two-part topcoat of high-luster, automotive-grade polyurethane paint that's color matched to the body panel; and they have twice the protection and fade resistance of previous models. Instead of six 8-volt batteries, we use four 12-volt batteries. It's more efficient and less expensive to maintain, and it also has fewer cables and terminal connectors. What's more, it's 57 pounds lighter than the old configuration. All the power with a lot less trouble. How do you make a chassis nearly 20 percent lighter and 2.5 times stronger? We mated an automotive, ladder-style, 100 percent robotically welded frame, protected by an 18-step paint process, with a polypropylene structural floor. Integrated into the floor, the battery box surrounds the batteries, eliminating a corrosion point. 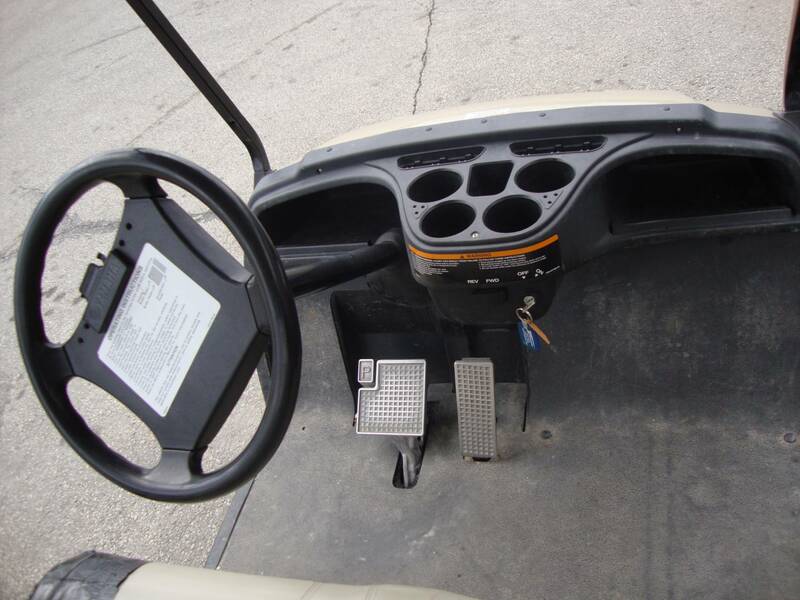 A self-contained pedal box gives the pedals top and bottom protection from dirt, debris, and stray golf tees. That awful grinding sound under the car is the skid plate striking a high spot. It's heard less often with The Drive™, because we improved our ground clearance by 12 percent to ride right over the rough areas. That's one reason we don't need a skid plate. On both our gas and electric models, we set out to beat our own best charge and mileage distances. When we were done, we did some checking and found out we beat everybody else's distances too. Nobody takes you farther for less. Running out of gas on the back nine is bad enough; it’s even worse when it happens to your car. So we increased the tank size of our gas model by a whole 4.6 percent. Integrated water channels divert water away from the batteries and electrical connections. The battery box is designed to keep debris and dirt from entering the compartment from below. Key electrical components are high and to the rear for maximum moisture protection and minimum interaction with battery acid. And all components are sealed and have marine-grade waterproof connectors. We're serious about protecting our electrical components. After all, without them, what do you have? With its advanced Yamaha-built motor control unit and battery charger, its regenerative braking system, and its Genius2™ motor control programming and diagnostics, the IntelliPower System™ is simply the smartest drive system ever built. Running a powerful 48-volt motor with full-circle communication between all components, this system does everything but watch where it's going. We had to leave some fun for the driver, didn't we? Exactly how import is an armrest? Depends on whether it's done right. Ours is strong, made of steel-reinforced, glass-filled polypropylene. It's larger and wider than previous models, but it doesn't interfere with entry or exit. It's substantial enough to provide comfort and security for the occupants, and if that's not important, what is? 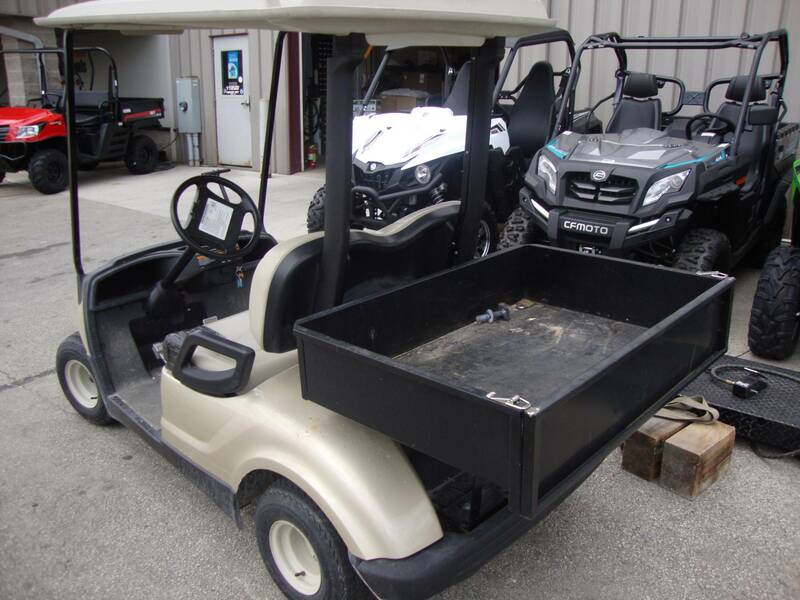 It's the biggest bag holder in the industry, but it has an especially low load-unload height and a wide, easy-to-use strap clip to hold two tournament-size bags securely in place while protecting body panels from scratches. It's made of scuff-resistant plastic, textured to help keep bags from slipping, and it comes with built-in drainage holes to keep bags dry and make cleaning easy. Deep, supportive contours are intended to help hold occupants in place while the car is moving. Designed to accommodate occupants of all different heights and sizes, it's made of pure, supple foam bonded to a seamless, fabric-backed vinyl cover, and the polypropylene seat base is strengthened with plated steel inserts. Won't sag or warp, stands up to repeated pressure washings, and remains the most comfortable seat in the business, despite daily abuse. If you need to access the starter, generator, governor and transaxle on the gas-powered car, or the motor control unit and vital electrical components on the electric car, you have the advantage of the largest access panel in the business. Open it up and make it happen. It's 39 percent larger than our previous sweater basket, formed of heavy-gauge, vinyl coated wire that won't rust or corrode and won't snag sweaters. It's designed to be easily cleaned and won't collect dirt or debris. It comes with an integrated sand rake holder, standard. Who would have thought a sweater basket could generate so much excitement? Someone who cares about his sweater, that's who. A lighter car, Yamaha engineers know, is easier to drive, accelerates faster, climbs hills more easily, and stops quickly. So we designed The Drive™ accordingly, trimming 4.2 percent of the weight from our electric car and 20 percent from the gas car. You can tell the difference when you drive The Drive. Slimmer is better. It's made of die-cast aluminum with no plastic parts. It won't corrode, and it needs no grease. Its throttle position sensor is an industry-exclusive solid state sensor that needs no adjustment-ever-since it has no moving parts. You can inspect it and its cable from above, so you don't have to jack it up to check it out. 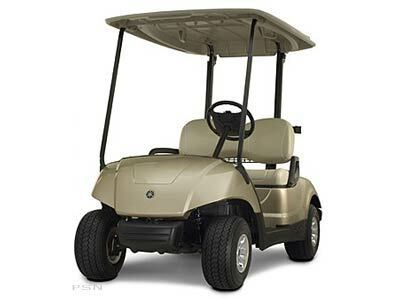 It's designed to accommodate all drivers-tall and short-with optimum foot position, and its textured surface helps keep the foot on the pedal. The cast-aluminum brake pedal has no need for grease, and makes no "drumming" sound when it's released, owing, of course, to the quality of parts surrounding it. It works with a single, Teflon™ coated cable that reduces the need for adjusting. It has an integrated three-position parking brake; it's textured and positioned to provide comfortable operation for all drivers. Based on a double-ended helical rack-and-pinion design, this is a steering system once found only in high-performance sports cars. We revised the steering ratio for a more nimble and responsive feel, put it in a stronger, die-cast housing and made it permanently greased with sealed bearings and no-grease fittings on tie rod ends. 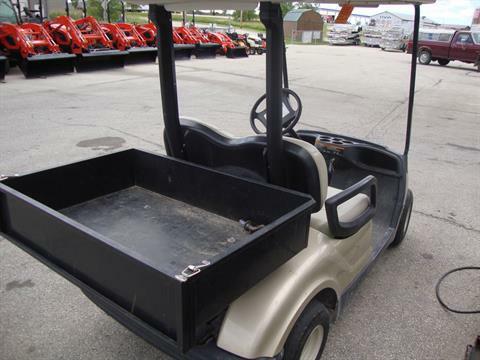 Easy to drive, and even easier to maintain. It's an industry exclusive. Our ATV-inspired clutch gives better response and greater hill-climbing power, it never needs grease, its internal components last longer, and its unitized construction lets you get it on and off with one bolt. Manufactured by Hitachi, our electric motor is high quality, highly efficient, whisper quiet, and generates 3.5 horsepower, which beats anyone else's in the business. Its internal components are nickel-plated and stainless steel for corrosion resistance, and it even has its own internal solid state tachometer. We trimmed 50 centimeters off our turning radius. It's not the tightest turning radius in the industry, but we think it's the most responsible one. It's calculated to perform geometrically optimal tight turns that won't damage your turf. So your players can have fun driving it, but not at the expense of your principal asset. First we reformulated our paint to give it twice the weatherability and fade resistance. We decided on seven lustrous colors, including four brilliant metallics. We put on a two-part topcoat using automotive-grade polyurethane finish. And we apply it robotically to give it a smooth, automotive-grade finish that would be a credit to the finest European sports sedans. On The Drive™, the inner fenders are one-piece, seamless plastic designed to keep delicate mechanical and electrical components from getting wet. 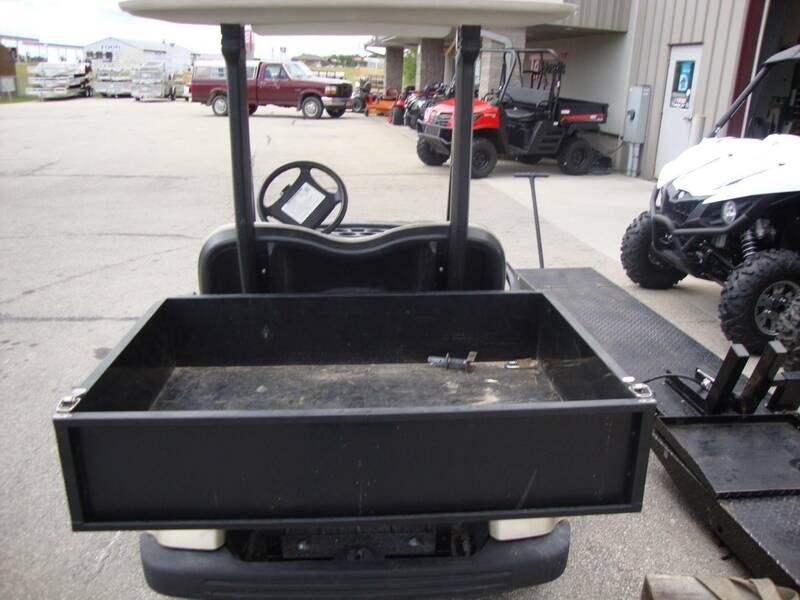 The rear wells include integrated mud flaps to keep your customers' golf bags from being splashed on. So everything important is protected. Check out the tread pattern on our four-ply tires. 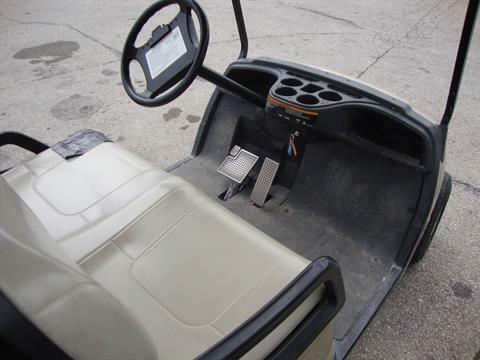 It's designed to provide superior on-course performance while minimizing turf compaction. The perfect combination of drivability and damage avoidance. Your car comes with 360 degree protection against scrapes, scratches, and bumps. Polypropylene side sills protect against side impacts in front of and behind the tires, and our energy-absorbing bumpers release air on impact to protect the body and frame. Hazards can approach from any angle. You're covered. 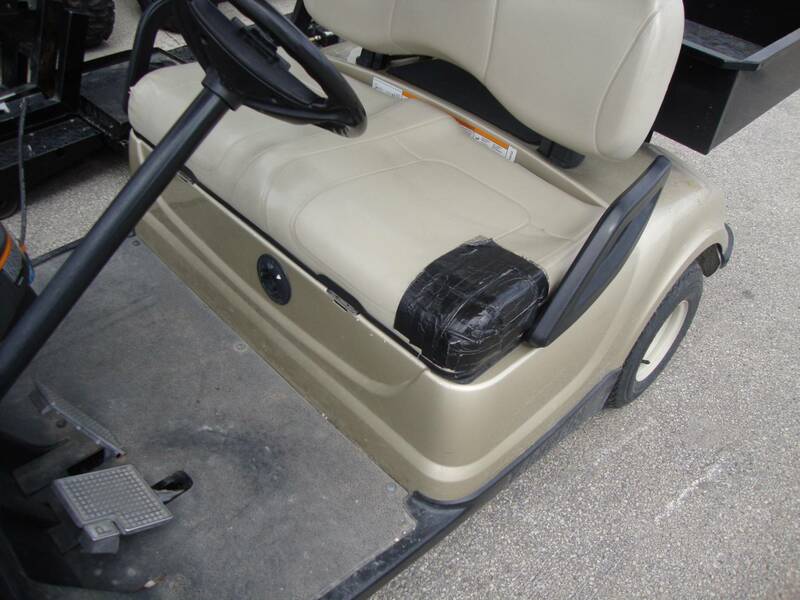 Our engineers decided early on that to end up with a truly great golf car, you have to begin with great parts. As luck would have it, we work for Yamaha, and Yamaha's parts are held to the industry's most exacting standards and most rigorous quality testing. Put enough superior parts together in exactly the right way, and voilá, we have a superior car. No other golf car has a suspension like this. We designed a maintenance-free suspension using automotive-style, coil-over-shock struts to minimize roll and deliver a smooth, comfortable ride. Sooner or later, some golfer will offer to trade you his car for it. We're the only manufacturer that designs and builds our own charger. It's compact and light, uses less power out of the wall, and doesn't hum. Its solid state Field Effect Transistor (FET) design is completely electronic, not transformer-based like traditional chargers. It communicates and stores charging information with the motor control unit, and it won't overcharge. The golf car with the bloodlines of a champion. Deep inside beats the heart of Yamaha, and etched in its muscle memory is everything we've learned from our motorcycles, ATVs, and watercraft. Hard-wired into its genetics is one overriding, irrepressible instinct: that driving a Yamaha ought to be fun. If we're going to be the only manufacturer building our own motor control unit, then we figured we might as well make ours the most advanced in the industry. It communicates with the battery charger, also Yamaha-built, and with the Yamaha Genius2™ diagnostic and programming system. 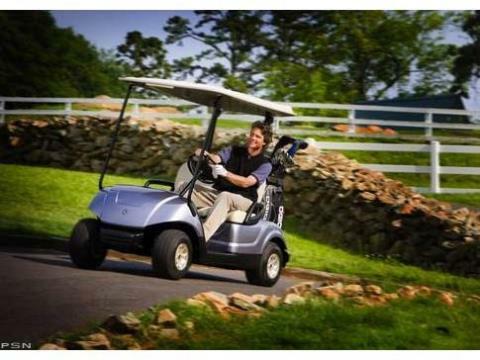 Its rollaway protection slows it down and lets you know if the brakes isn't properly engaged, it ensures smooth starts to avoid turf damage, and its solid state electronics include a microprocessor with high-efficiency switching. Golf cars don't come any smarter.